Morning is not a favorite place in my house if woken up too soon. My girls are sluggish and often cranky if they just aren't ready to wake up. Often times, we might be in a hurry to get moving and if I rush too quickly, they just end up crankier or even in tears. This is where I try different things to get them moving and shaking by healthy alternatives for breakfast as I'm a staunch believer in putting healthier foods in their bellies. As part of my participation with SocialMoms, this is a sponsored post but I wanted to recognize that the reason I prefer the Silk brand is due to the non-GMO verification as well as no artificial colors, flavors or funny business. Silk Fruit&Protein also is ideal in that it provides soy protein, calcium and vitamins C and D, no cholesterol or saturated fats and free of dairy, lactose, gluten, casein, egg and MSG. My youngest has a severe type of asthma that is triggered by colds so any extra vitamins C and D is important to me. She's also allergic to dairy products so Silk Fruit & Protein is the perfect choice. My ultimate goal is to have two happy ones in the morning! Not only do I make sure they get enough sleep but I also make sure they are eating healthy. It's a dynamic circle how the proper amount of rest, healthy foods and drinking water seems to affect their behaviors. Since mornings can be our most trying time of the day, I like to wake them up with time to ease into the day. Starting the morning with Strawberry Banana Silk Fruit&Protein is ideal since they love the tastes of milk, strawberries and bananas. This gives them the kick start to get moving. I often find having them help make breakfast is another good way to get them up and moving along with a review of the day's activities. Another great use for this is to add ice cubes and blend for a quick smoothie as what kid doesn't love an icy drink especially for breakfast? 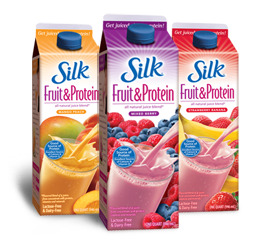 Silk Fruit&Protein also comes in Mixed Berry and Mango Peach which I will have to give it a try. With summer around the corner, the varieties will make a nice refreshing change as well. The beauty with Silk Fruit&Protein, it can be served anytime during the day. Click this link to find Silk Fruit&Protein store locator and click to get this great money saving $1 off coupon for Silk Fruit&Protein. This blog post is part of a paid SocialMoms and Silk blogging program. The opinions and ideas expressed here are my own. Check out my giveaways here.